The cannabis and hemp industries present an extremely unique career environment for job seekers. Challenges faced in searching for cannabis jobs arise because the industry is brand new and lacks in traditional professional cannabis training opportunities. Working as recruiters in the cannabis space, Mac & Fulton Talent Partners see firsthand the difficulties faced by those looking to find professional cannabis training. This notion is heightened when it comes to cultivation career training. Of any career path in the marijuana business, cannabis cultivation jobs are the toughest to staff. This notion is partially due to an overall lack in professional cultivation career training programs. Also, many experienced cannabis growers find their roots in the black or grey market, making their expertise extremely difficult to verify. To make this notion more complicated, grower positions garner a good deal of attention from novices outside the industry claiming to be “master growers.” Therefore, hiring parties looking to on-board a skilled cannabis cultivator face many challenges. These include sifting through a good deal of questionable information in understanding who will be a fit for their company. In more traditional career environments, the fact that an applicant has a relevant college degree takes much of the “guess work” out of the hiring process. This is because, hiring parties can see exactly what these candidates have studied in school. With this info, they can objectively weigh this coursework against their minimum hiring criteria. It goes without saying, this process is almost non-existent concerning cannabis cultivation jobs. Anyone who has researched an education for marijuana growing has doubtless run into online training programs, such as THC University. Generally, these online schools offer horticultural instruction by way of video tutorials and online quizzes. This online training can prove quite helpful in achieving a basic understanding of cannabis growth processes. However, it does not qualify anyone to be a managerial-level cannabis cultivator. As such, online certifications are beneficial for those interested in pursuing entry-level positions as cultivation technicians or harvest workers. States like Colorado offer compliance training programs for those looking to understand the rules and regulations of the cannabis industry. Looking to cultivation positions, it is recommended that underground growers engage in this sort of training to make their experience more marketable in the regulated industry of today. 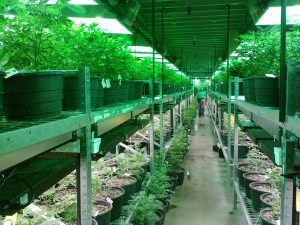 Not only does formal compliance training show that a grower is willing to “play by the rules” in a compliant operation, it also shows they understand track-and-trace protocols of such entities as the Colorado MED (Marijuana Enforcement Division). For those growers who are truly passionate about a managerial-level career in cannabis cultivation, a four-year degree in Controlled Environment Agriculture is a great choice. To illustrate, schools such as Cornell University offer extensive training in both indoor and greenhouse crop production. This coursework applies seamlessly to cannabis cultivation. One of the real draws of programs like this is up-to-date training on cultivation equipment and technology. As the cannabis industry grows increasingly competitive, businesses are streamlining operations with smart grow equipment and software. As such, formal training in cutting-edge technology and methods is a must for higher-level cannabis cultivation jobs. As of right now, Northern Michigan University is the only accredited college that offers a four-year degree program dedicated solely to cannabis. The program is titled Medicinal Plant Chemistry.It covers horticultural techniques as well as medicinal applications of cannabis. Northern Michigan University is seeing an overwhelming interest in their cannabis program. Therefore, other accredited schools are sure to follow their lead. This progressive program is a great avenue for growers looking to understand the fine details of cannabis-based science. As the cannabis industry continues to evolve with widening legalization, options for cannabis cultivation career training will continue to evolve with it. For the time being, growers have a few solid avenues to follow in developing marketable resumes for cultivation careers. As things progress, we will also gain a clearer understanding of what key attributes make one qualified for higher-level cultivation positions. In the end, career opportunities in cannabis jobs and hemp jobs will ideally be met by a qualified talent pool of cultivation experts. This article also appeared on Grower’s Network in November 2018.